Activists marched to Trump Tower in New York in anticipation of President Trump's elimination of the DACA program. In recent months, Erazo says, he's had to be honest with students and their parents. He stopped encouraging them to apply for DACA, which stands for Deferred Action for Childhood Arrivals, because of the likelihood the Trump administration would revoke it. The program has allowed young immigrants who were brought here illegally as children to remain in the U.S.
"I'm an educator, not an immigration lawyer," Erazo says. "But these are children who did not make the decision to enter the U.S. illegally. They broke no law and they've grown up as American as you and I." Erazo is one of thousands of educators around the country struggling with what happens next following the Trump administration's announcement this week that it is ending the DACA program. 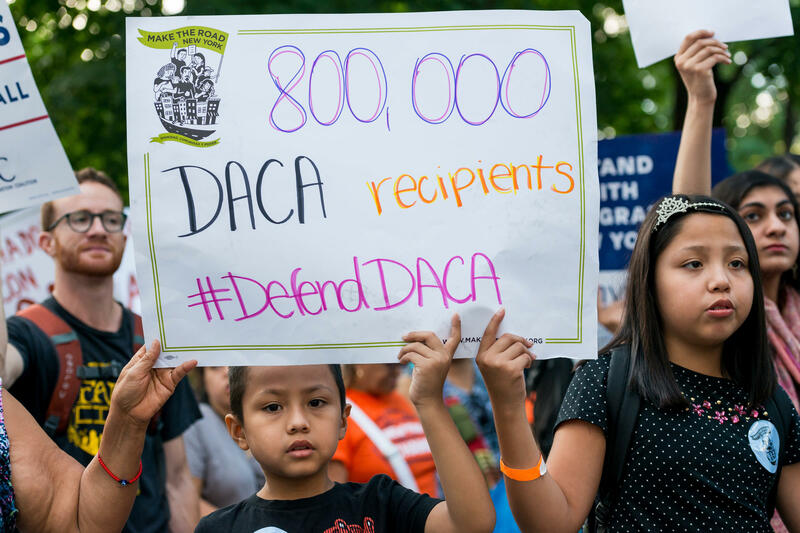 Essentially, the president wants Congress to decide the future of the 800,000 DACA recipients, and the administration has given lawmakers a six-month deadline. As an example of the young people who are facing uncertainty, Erazo tells me about 22-year-old Maria Diaz. She was just a year old when her parents left Puebla, Mexico, crossed into the U.S. illegally and settled in Olathe, their home for the past 21 years. In 2012, while she was still in high school, Diaz applied and qualified for DACA. Erazo helped her with her college application to the University of Kansas, which gave her a scholarship and allowed her to pay in-state tuition. Today, Diaz is a junior majoring in business, with a full-time job at Bank of America. She worries that, with the end of DACA, both her college education and her job are at risk. "My education can hopefully continue but without that income, I'm not sure," Diaz says. She recently renewed her DACA permit, so she has at least two years to figure out what she's going to do if and when the program ends. She does not discard the possibility of being deported and having to move to Mexico, a country she has never visited. According to the Migration Policy Institute, 76 percent of all DACA-eligible immigrants are currently in the labor force. A quarter of them go to college and work. About 5 percent have gone on to earn at least a bachelor's degree. Now that President Trump has handed the issue to Congress, immigrant rights groups say they will lobby House and Senate leaders, especially House Speaker Paul Ryan, R-Wis.
Ryan said on Tuesday that while he believes the DACA program was an "abuse of executive authority," he nevertheless hopes Congress can "find consensus on a permanent legislative solution." It's unclear, though, whether that can happen within the six-month extension that Trump has called for. "It is important that those affected have clarity on how this interim period will be carried out," Ryan said. That means that, for the time being, Maria Diaz and other young people like her will have to wait. "The uncertainty sometimes is too much to bear," she says, "but we have to remain hopeful."